Just recently I have been posting photographs of a 1964 holiday to Scotland in which I have been bemoaning the fact that none of the photograph locations are easily identifiable. So I was quite amazed when my sister informed me she still had the window stickers which we bought at many places we visited and which might help to identify the photographs. 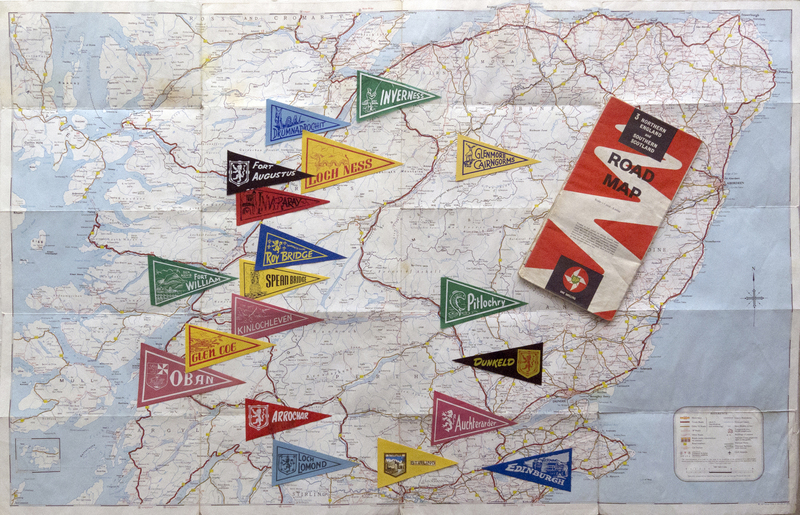 Plastic pennant flags of places visited were all the rage in the early 1960s, particularly with caravaners who liked to adorn their van windows with souvenirs of all their conquests. I guess my father must have first noticed this trend at the caravan site at which we stayed near Musselburgh, as the first sticker is from Edinburgh. My father was very honest with the collecting of these little flags and we would never purchase one if we hadn’t actually visited the place. Using the flags as proof of a visit, and knowing and identifying some of the sites at which we stayed, along with personal recollections, I thought I’d attempt to work out which route we might have travelled on our two-weeks holiday in 1964. I used the original maps purchased for our trip, which I still have in my collection, they cost 1/- each, but I have used a modern map over which to lay out our probable route (green). The red dots are places for which we purchased a pennant and the blue dots are known caravan site locations at which we stayed. From an overnight stop at Askham Hall near Penrith we would probably have travelled up the A7 from Carlisle to the campsite at Musselburgh, a few miles from Edinburgh, I mentioned this site a few days ago. After staying there a couple of days to enable us to visit the capital city we travelled westerly towards Stirling to pick up the A9 towards Perth. No doubt we would have used the Forth road bridge but, although completed, it hadn’t yet opened when we passed. After collecting a few more window stickers en-route we stayed next at a site on the banks of Loch Tummel. Photographs taken here show this was a steep site but with a stunning view of the loch and its island. 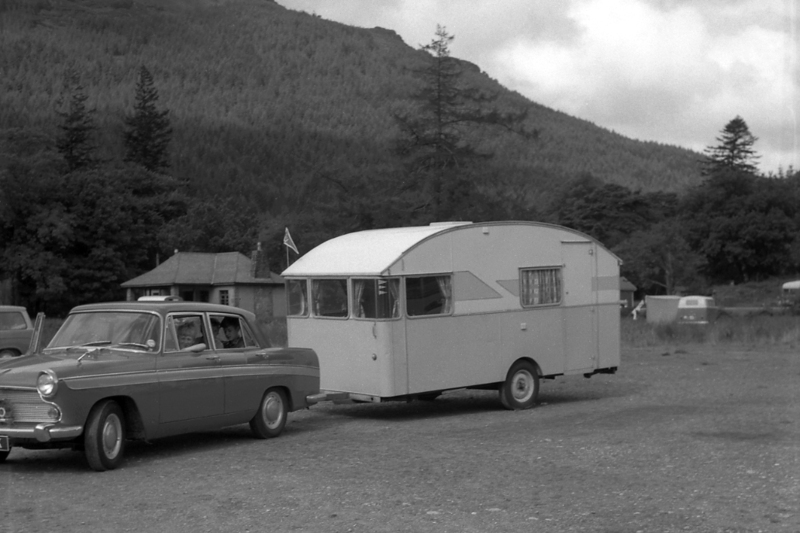 The next caravan site we can identify is at Glenmore in the Cairngorms, to reach here we would have continued north on the A9 until we reached Aviemore and then taken narrow side roads to reach the site. There is a story attached to this location, but I’ll leave that for another time. The photo shown here was taken by my father as we were about to leave the camp site at Glenmore, it was obviously my brother’s turn to sit in the front seat. From here we appear to have retraced our steps for a short way before dropping down on the A86 to Roy Bridge and then at Spean Bridge turning north towards Fort William, Loch Ness and our next site near Drumnadrochit. We stayed here a couple of nights and drove without the van to Inverness during this time. I believe we stayed near Urquhart Castle at a site where the owner’s young teenage sons wore kilts and where a piper woke us up every morning to an ear-offending skirl to announce the arrival of the milkman; but that might be in my imagination! 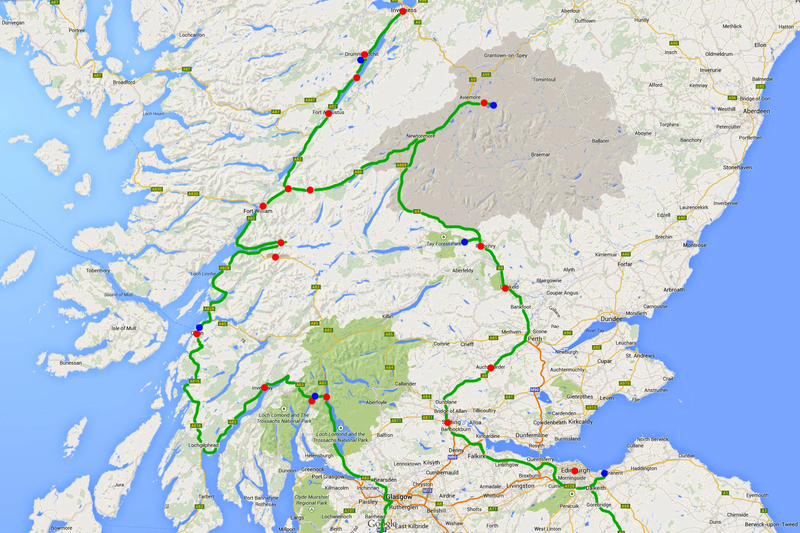 We then travelled south on the A82 towards our next destination of Oban. The bridge at Glencoe hadn’t been built so it was a long trek around Lochleven before picking up the A828 to Oban where we stayed a few nights at Ganavan Sands which I’ve already mentioned in three of my latest blogs. From here, and I’m guessing, we travelled south and followed the coast road to reach the A83 where we turned northwards past Inveraray and on to our next site near Arrochar. I remember this site, it poured with rain all the time we were there and one of the young German boys in the van next to ours fell in a deep bog up to his waist whilst attempting to cross it and his father had to summon assistance to extricate him; he was eventually dragged out minus his trousers, socks and wellington boots and had to walk the short distance back to camp barefoot in his underpants and in the pouring rain. We didn’t witness any of this however, we heard about it after the event; odd the strange things one remembers. The journey home was via Loch Lomond and skirting around Glasgow it would have been a long and slow journey pre-motorway. I remember we stopped overnight at Market Drayton on one caravan holiday, but not really sure if it was on the way home from this adventure. We collected twenty stickers from our Scotland trip but I’ve only shown nineteen as one got stuck in my pocket, I’ve also placed the Inveraray one in the wrong place on the map. In subsequent caravan holidays a lot more stickers were acquired, North Wales and Cornwall proliferate, but there are also flags from other isolated locations the caravan visited. Maybe we’ll chat about those holidays another time, but I haven’t yet finished with tales of Scotland.